Violent Crimes in the U.S. The problem underlying the rationale for restrictions on gun ownership is the prevalence of gun violence in this country. Homicides committed with firearms rose to record height in1993 with a peak of 17,075 deaths that year but declined in number until the turn of the century. In 2005 the number of gun-related homicides was 11,346, the highest it has been since 1999. As seen in Figure 1, handguns are consistently the most common weapon used in homicides, followed by other types of guns as the second most common weapon used in this century. Figure 1: Handguns are unquestionably the most common weapon used in murders while homicides committed with other types of firearms have been increasing since 2000. Although according to an analysis of the National Crime Victimization Survey (NCVS) there was half the number of nonfatal firearm related crimes committed in 2005 compared to the height in 1994, there were still almost a half of million victims in 2005 from such crimes. Nationwide in 2006, 68% of homicides, 42% of aggravated assaults, and 42% of robbery offenses involved firearms. The two largest groups affected by gun-related homicide are people between the ages of 15 and 24 and the victims of intimate partner violence. Since 1976, 77% of homicide victims between the ages of 15-17 were killed by a firearm; and as of 1990, 67% of intimate partner homicide victims died from firearm related injuries. Understanding the extent to which guns are used to victimize and kill– most commonly teenagers, young adults, and the victims of intimate partner violence – is important in deciding the risk factors associated with gun ownership. Another problem associated with the United States’ liberal gun culture is its effect on the international community. The Mexican drug cartels are the largest providers of illegal drugs to the United States and as associated with 40,000 deaths over the last five years. According to the United States’ government, nearly 90 percent of weapons used by drug cartels originate from the American states bordering Mexico. These border states, in particular Arizona and Texas, also have the most lenient restrictions on gun control and so access to nearly military-grade weaponry that is illegal in Mexico is comparatively easy. The fact that Mexico has extremely strict gun control laws – and only one gun store in the country – is nullified by the ease of which guns can be obtained for illegal purposes in the United States. Although the United States has taken measures to try and dismantle these armed cartels which pose serious dangers to U.S citizens, it is argued that the government’s funding of the Mexican military and police has only led to an increase in armament on both sides. 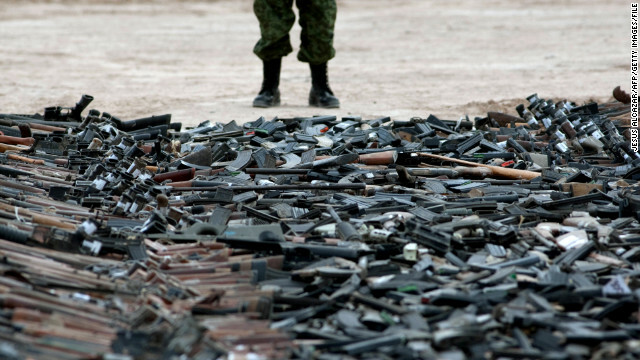 Stricter gun regulations on a state or federal basis to prevent cartels from accessing weapons are necessary for demilitarizing these drug trafficking organizations. An often unnoticed and rarely discussed effect of unrestricted gun ownership is its association with suicide rates. Research following the gun control law, Criminal Law Amendment Act of 1977 (Bill C-51), in Canada found that statistical analysis suggests that the law succeeded in reducing firearms suicides, especially for those in high risk age groups, teenagers and young adults. The review of the literature conducted by Leenaars on suicide rates in response to the Criminal Law Amendment Act (which increased requirements for purchasing and storage permits for firearms) shows that suicide by firearms have decreased with no increase in other forms of suicide even when controlling for outside social variables like unemployment rate, proportion of young males in the population, drug/alcohol use, etc. Similar studies have been conducted in New Zealand, the United States, and Australia which support the conclusion that suicide by firearm rates decrease with the introduction of gun control legislation. It is important to note that these findings also show that other methods of suicide do not increase as firearm related suicide decreases. That is, people are not just switching from using firearms to other means of suicide. Although the numbers associated with suicide rates are not as powerful as the number of deaths caused by firearm related homicides, lives depend on the development of stricter restrictions for gun ownership. From “Homicide Trends in the U.S.” by J. A. Fox and M. W. Zawitz, July 11, 2007. Bureau of Justice Statistics Website. From “Crime Victimization, 2009,” by Michael Rand and Jennifer Truman. October 13, 2010. Bureau of Justice Statistics Website. From “Firearms and Crime Statistics.” March 1, 2007. Bureau of Justice Statistics Website. From “Percent of Homicides Involving Guns by Circumstance.” April 3, 2008. Bureau of Justice Statistics Website. From “This is Gun Country: The International Implications of US Gun Control Policy,” by Laura Mehalko, 2012, Boston College International & Comparative Law Review, 35, p297-330. 7 From “Man Gets 25Years for Trying to Buy Military Weapons for Cartel,” August 23, 2012. CNN Website. 6 From “This is Gun Country: The International Implications of US Gun Control Policy,” by Laura Mehalko, 2012, Boston College International & Comparative Law Review, 35, p297-330. 7From “Gun-control legislation and the impact on suicide,” by A. Leenaars, 2007, Crisis: The Journal of Crisis Intervention and Suicide Prevention, 28, p50-57. From “Gun-control legislation and the impact on suicide,” by A. Leenaars, 2007, Crisis: The Journal of Crisis Intervention and Suicide Prevention, 28, p50-57. Of course Mexico’s violence has nothing to do with the DEA and ATF enabling chainsaw-happy narco thugs. It’s all the fault of those evil gun owners!